Playing with a cat has many upsides. Besides providing activity, fitness, and weight management, playing also serves several behavioral advantages. Play lets your cat express his natural behavior, bond with you, and reduce the boredom and redundancy of life. Regular playing is one of the key factors in preventing most bad behaviors in cats, from constant meowing to aggression towards family members. While playing isn’t a magic wand, it almost appears as one. 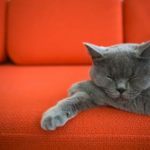 In cases when problems are caused by boredom, which causes the majority of behavior problems with indoor cats, increased playtime alone can help turn things around. 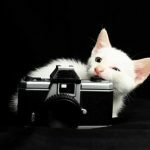 In this article you are going to learn how to play with your cat and how playing can help solve cat behavior problems. Did you know: Animal welfare defines five freedoms that must be granted to captive animals (and pets). Along with freedom from hunger and freedom from injury, freedom to express natural behavior is equally important. 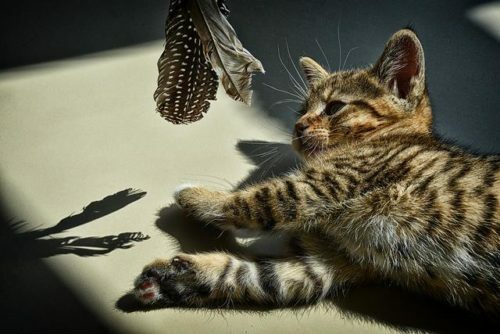 For cats, the natural behavior of hunting can be easily provided through play. How do you play with your cat? Or do you play with your cat at all? There are two ways to provide a cat with physical activity (no, there are actually 11): interactive play, where a cat owner plays with the cat, and solo play, where a cat plays with toys all by himself. Interactive play is play where an owner directs a toy, such as a mouse on a string, butterfly on a stick, or simply pulls a thread. The best part is that the owner can reproduce the natural movements of a cat’s prey, thus the cat expresses the natural prey drive without the need to kill anything. There are also electronic cat toys that imitate prey movements without an owner’s participation. The cat gets his hunting, but the bonding part is missing. 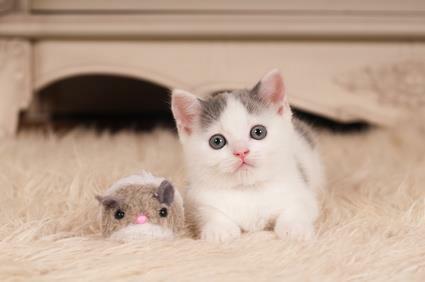 Solo play is play in which a cat plays with toys by themself, such as fake mice, balls, toys on springs, and food puzzle toys. Solo play toys are great, but sometimes your cat may look for more. One must remember that this kind of play is supplemental and not a replacement for interactive play. It is not as advanced but helps to “buy” more playtime. Naturally, cats spend at least three hours of their day hunting. As much as we love our pets, we can’t blame ourselves for not finding three hours to devote to our cats, right? For the most fun, you can have different types and kinds of solo play toys (store bought and self-made). Toss them in several locations, and hide some of them, such as inside or behind boxes, bags, or cat carriers. Solo play toys can also have an interactive element from time to time if you occasionally pick one up and throw or roll it for your cat to catch. Rotate a set of solo play toys every three days or so to keep them fresh. When and how often must you play with your cat? Regardless of how many toys you buy your cat, the most important investment is your time. That is, the amount of time you can devote to playing with your cat, letting him stalk, chase, and grab the toy you move. It’s not mandatory to devote a ton of time though. The more the better, of course, but it’s completely satisfactory to have few short sessions, as short as five minutes, each day. 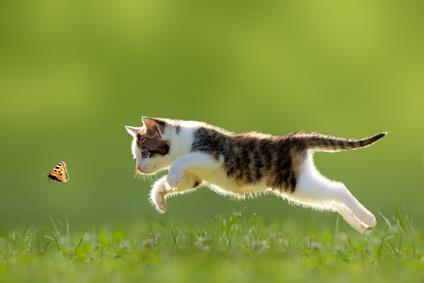 The way cats hunt in nature suggests that they are apt for short attention bursts. It is completely satisfactory to play with your cat for five minutes if you do it regularly. How often to play with a cat? Well, even once a day is better than none. Two to three is even better. To stay realistic, the average busy person won’t make much more time, though if you can fit more in, that is perfect. The best times for playtime are before meals. Cats naturally hunt after they wake up and before they eat (which is reasonable because they eat what they catch). If you feed your cat in meals, you can try to have at least a short play session before, although it is not necessary to play before every single meal. For example, play with your cat and then serve its meal before you leave home in the morning. When you come back, give your cat a treat ball with the second meal inside. Right before you go to sleep, play with your cat for another five minutes and serve the final meal. This is guaranteed to reduce your cat’s nocturnal activity within a week if you stick to it. 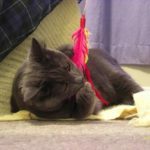 What toys are the best for playing with your cat? This depends more on your own preferences and the preferences of your cat. The most popular types are feathers on a stick and a mouse on a wire or string. We suggest that you get a few of them and see which one your cat prefers most. And remember, alternating them from day to day helps maintain your cat’s interest. Play must provide the same stimulation as hunting would. Different toys and different playing styles can resemble different prey animals. The most common are mice, birds, and butterflies. You have to understand how they move in nature to spark your cat’s interest in them. A mouse usually moves along walls, hides in corners behind obstacles, and doesn’t fly. Birds fly from spot to spot, pecking for a while at each stop. Butterflies slowly fly from spot to spot, wiggling vigorously along the way. Any ideas how a toy on a stick or a string can replicate these? It’s okay to have some deviation from the movement of natural prey as you play with your cat; he is not stupid after all, and he knows it’s just a toy. You must let your cat stalk the toy, follow it with a gaze, slowly approach it, and then attack. Not all pounces must be rewarded with success, but a significant fraction of them should. Because of this, unreachable objects are not the best choice for playing with cats. For example, laser beams and balls inside a container can’t be obtained. Even though they provide activity and fun, they can also add frustration. The thing to remember is that prey rarely moves rapidly back and forth, dangles in the cat’s face, or swirls round and round it. It may be fun to you or YouTubers, but if your aim is to reduce your cat’s frustration, this is going to fail. As you play with your cat, try to incorporate your home environment in the play as much as you can. Let your cat jump on a cat tree or other furniture, move the toy out of sight behind an obstacle or to another room, and let the cat follow. Feel free to set up new obstacles. For example, a cardboard box on the floor makes an obstacle to move the toy behind, around, over, or inside. 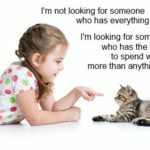 If you find that your cat is not cooperating with your playing incentives, see our article with tips to play with an unwilling cat. Let your cat catch the toy from time to time so he feels the confidence of being a great hunter. 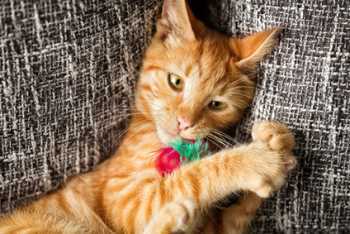 When a play session is about to end, it’s best to let your cat catch the toy and switch it with a treat or a meal. This follows not only natural cat behavior but also the Theory of Everything. Food logically comes after hunting, not before it. While the cat eats, remove the interactive toy and store it safely out of reach. Toys on strings present a tangling risk if cats are allowed to play with them unsupervised. Putting the toy away also helps to keep its freshness. Solo play toys are better suited for your cat to play with while you are not around. If you have more than one cat, the best strategy is to have separate playtime for each of them. Depending on their personalities, play can happen behind closed doors or while the other observes. For example, we have a cat who always comes first when he hears a toy. He is so intrusive about getting it that the other cats get pushed away and are left frustrated when this happens. The obvious solution is to invite each cat to a separate room, close the door, and have some private play time. You can find other tips for owners of more than one cat here.